He looks like a fanciful creation from one of Jules Verne's novels: ‘Steam Powered Butler JF-09'. 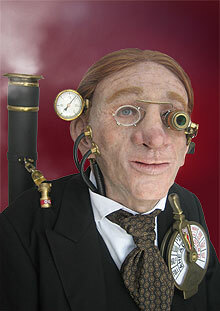 A nostalgic man-machine , using steam technology and accompanied by an engineer who operates him with a remote control. The engineer will demonstrate the abilities of the automatic butler, will be busy with checking the gauges and topping up the oil and provides a real butlerservice ! Machinery noises, manometers, glowing radio tubes…and tow butlers who could have come straight from the Victorian Age. Be surprised! Steam powered butler JF-09 is an interactive walkaboutact, that will move from one location to another on a wheeled device. The act involves little microplays with all kind of gimmicks and can be played for all sorts of crowds. People will see an astonishingly realistic looking man-machine creation. To get this result Jonas & Friends developed an unique flexible silicone mask, use a monitor and hidden sound systems and built beautiful machine parts.